a lovely poem, Matt. Happy Friday the 13th! I love all the painting in your poem, Matt. Thank you! And how exciting, the museum featuring art from the book! Congratulations! Yes, that is way cool that your book is hanging in a museum! Congratulations! I’m glad you shared the fall poem here, too. It is definitely time for the leaves to begin painting the trees and ground. We had our first frost of the season last night, so everyone around here is in much more of an ‘autumn’ sort of mood now…thanks, Kay! Love your imagery, Matt—the painted trees painting the ground. I was just talking to my folks in PA, they said the leaves are coming down without changing color at all—it’s been too warm. 😦 We’re used to that here in Florida, but in Pennsylvania??? Glad to hear you finally got your first frost in NH! We, too, are seeing a lackluster year of color – partially due to the warmth, partially due to the dryness of the past 4-5 weeks, as well. But the apples are a bumper crop, so all is well! Thanks, Michelle. Our ground is being painted, and painted again, Matt. Love your poem, and congrats for being in Amy’s book. I can’t wait to read the book! You’re welcome for my nomination, so well deserved. Best wishes in the deliberations! I’m off to Highlights tomorrow, remember my first time with you and all the others, a special memory! And, wish I was closer to see the museum installation-so great! Thanks, Linda – safe travels, and please tell everyone you see I said hi! OH, your enthusiasm is contagious! First frost….we are waiting still in Virginia. I have a feeling we will be waiting a while since we’ve had near tropical heat. But, once the weather turns, I’m sure I’ll be complaining about the cold. It is very COOL that your book is in a museum and you are still alive. lol. Mother Nature’s painting is a swell ditty. I think today is the day we will buy pumpkins. Thank you, LInda! It was in the 80s here just a couple of days ago, so the fact that we had such a hard frost was quite surprising … but then again, up here in New England, nothing is all that surprising when he comes to the weather! Enjoy your pumpkin picking ! Thank you so much, Amy – and congratulations again on all your successes! I’m looking forward to featuring “Poems are Teachers” next Friday! Beautiful poem, Matt. Having at last experienced a leaf-dropping autumn, I know what you are talking about. And experience your poem in my heart – not just my imagination. It’s a lovely feeling! Oh, thank you so much, Kat – I’m glad you got to enjoy autumn they way we do! Matt, I loved this poem from the moment you sent it to me and I still love it. When you have the appropriate Autumn Ablaze photo and poem will you send it to me for inclusion on my new fall gallery. The invitation is at http://beyondliteracylink.blogspot.com/2017/10/autumn-ablaze-invitation-to-create.html. Thanks for your always support. I will, Carol – thank you so much! Actually, I just remembered I emailed you the haiku from a couple weeks ago…did you receive it? Matt, I just checked my gmail again and can’t find an email with your poem. Can you please resend it? 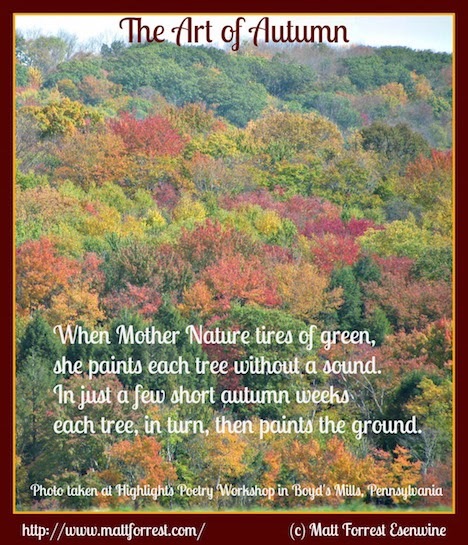 I like the round robin painting in your fall poem Matt, first Mother Nature then the trees! Congrats on the nomination for the CYBILS, how exciting!